Ben Cohen & Jerry Greenfield, the founders of the delicious ice cream company Ben & Jerry’s, have long been politically active in advocating for the under represented. The issues they’ve fought for through organizations like Stamp Stampede and The Ben & Jerry’s Foundation are being championed by Democratic presidential candidate Bernie Sanders. That’s why most recently, Ben & Jerry have been hitting the campaign trail to get people to “Feel the Bern”. Five days before the NH democratic primary, I had the opportunity to document a day in the life on the campaign trail. In between photographing them psyching up volunteers and voters, I asked them why they feel Bernie is a once-in-a-lifetime candidate and how they’ve been helping in primary battlegrounds. Ben & Jerry speak about Bernie at Book & Bar in Portsmouth, NH. Julia: What is it about Bernie that excites you so much? Jerry: Ben and I have been constituents of Bernie for about 30 years. We've seen him first hand in action and he's been steadfast in working for veterans, students, seniors, and working class families. He's the only one who tells the truth about how our economy works. The system is rigged to the advantage of the super wealthy and corporations. And he's the only one who is willing to take them on. Ben shows off his lighted Bernie sign at the Manchester Bernie Headquarters. Julia: How has it been working on the Bernie campaign? Jerry: It's tremendously exciting. I want to do everything I can. As Ben says, Bernie is a candidate that comes along once in a lifetime. We just want to do all we can. Ben and I have never campaigned for any other presidential candidate, this is really something special. Every little bit we can do feels great. Ben cheers on volunteers at the Portsmouth Field Offices. Ben: It's been a privilege to help get a decent president elected. To finally have a president you can feel proud of and that's going to accomplish the revolutionary changes that are necessary. It's been a grind, you know it's been hard. It's been really tiring us out, we don't understand how Bernie does it. Volunteers gather around Ben & Jerry at the Portsmouth Field Offices. Julia: How long are you going to stay on the road? Ben: We are going to keep going as long as Bernie keeps going. We are going to keep going until he's in the White House! That's how long we are going to keep going. After enjoying their second breakfast of the day, Ben & Jerry depart from the Red Arrow Dinner to scoop ice cream for volunteers in Manchester. Julia: That’s what I like to hear. How was Iowa, were you there for the caucus? Ben: We were pre-caucus. There was a lot of excitement. There was a lot of down to the wire tension. Electricity. The nature of campaigns is the slogging it out, on the ground, going around knocking on doors, phone banking and talking to people one by one. The majority of the really hard work is not that exciting. It's in the background. No one sees it. And we were going there, thanking, hopefully psyching up and motivating all the volunteers who are doing that work. Ben scoops ice cream for the volunteers at the Manchester Field Offices. Julia: If I was a volunteer, that would make my day. I'm sure it helps a lot. Ben, how is the Stampede going? Ben: Stampede is rocking! Stampede now has 60,000 members, 60,000 people stamping around the country. We are getting a thousand new stampers a week. We are feeling good about it. In terms of our goal of getting it to be part of the presidential debate and conversation, that's gone pretty well. Every democratic candidate has come out in support of amending the constitution to get money out of politics, but Hillary's amendment is a little, how shall I say, nuanced. She says she wants to get unaccountable money out of politics, but that would allow all the money that she is getting above the table to still come in. Bernie has been the biggest advocate for getting money out of politics, and for bringing that issue into the national, political, and presidential debates. We've had problems getting the media to ask debate questions that relate to money in politics. An advertisement for a Stampede Stamp at the Ben & Jerry's Ice Cream in Manchester, NH. Julia: Yeah, it's been bizarre to watch an official debate and see official polls and see media outlets report it with a completely different spin. The primary reporting in general is very confusing even for someone who tries to look for the bias. For example, a newspaper declares support for an official candidate, and I’m seeing that affect the reporting. It's very hard for me to trust what certain major media outlets and pundits are promoting this campaign. Ben: There is probably more trust in the media by older people than younger people. Jerry & Ben approach people at Book & Bar to talk about why Bernie is a compelling candidate. Julia: A lot of people on the Bernie campaign are really young. Ben: It's probably that the establishment media, the establishment parties you know are all supporting the establishment candidate, Hillary. The older people put some stock in those institutions, while younger people are not getting their news off the mainstream media. So what do you know - they are more in favor of Bernie because they are seeing information older people are not really seeing. Ben & Jerry interviewed by a reporter from CNBC in Portsmouth, NH. Julia: You've done a few AMAs on reddit, what do you think of reddit and some of the new forms of media? Ben: I think Reddit it great. I think that any media that is kind of crowdsourced is really beneficial. I'm sure on the other side, in terms of conservatives, I wonder if there is a crowdsourced media like reddit. The demographics have always been showing that as we move on in time, as the baby boomers fade out and the younger generation comes in, that they tend to be much more democratic, much more progressive, and that does not bode well for the republican party. 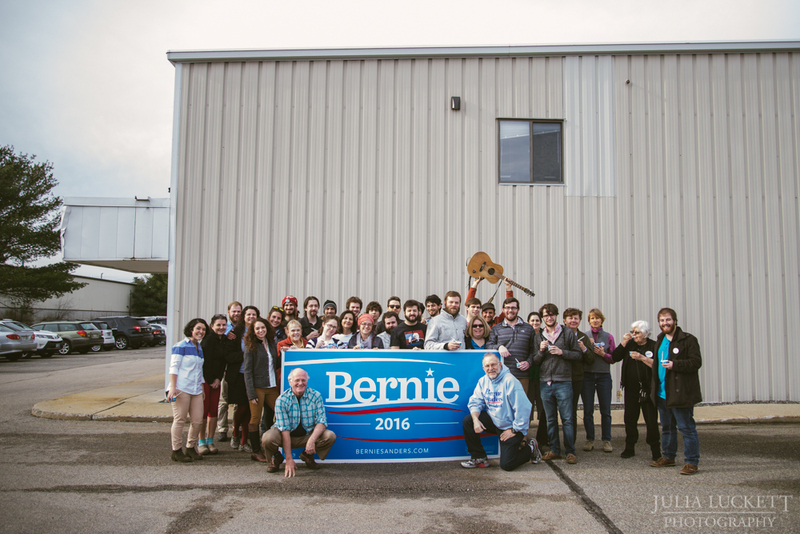 Ben & Jerry meet with some of the national volunteers at the Manchester Bernie Headquarters. Julia: That's very true. What are some of the highlights from the campaign so far? Jerry: I like going around with our lighted Bernie signs because they are unusual. It brings a smile to everyone's face and it's a way for people to demonstrate their support for Bernie. Jerry displays his lighted Bernie Sign outside the Manchester Field Offices. Ben: And I’ve been working on a “Feel the Bern” workout with the signs! Julia: Awesome. Well thanks for talking with me today, and good luck on the campaign! Special thank you to Emily Cavanaugh for her excellent scooping, coordinating and driving skills.